After a long hiatus, San Francisco Cinematheque has recently published Volume 7 of their journal Cinematograph. Cinematograph Vol. 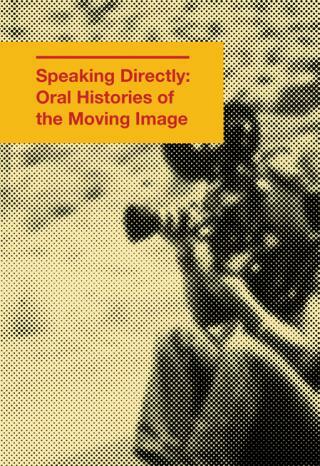 7: Speaking Directly – Oral Histories of the Moving Image, (cinematograph no. 7, 2013) edited by Federico Windhausen, features recent conversations with filmmakers, artists, curators, and scholars. An interview with Coleen Fitzgibbon by Sandra Gibson and Luis Recoder is part of the publication! Beside myself, other filmmakers interviewed include Narcisa Hirsch, Jim Jennings, Chris Kennedy, Kerry Laitala, Annette Michelson, Tomonari Nishikawa, Elizabeth Price, Ben Rivers and Kidlat Tahimik. Interviewers beside Sandra and Luis, include Erika Balsom, Kathy Geritz, Aily Nash, Lucy Reynolds, Jonathan Walley, Mark Webber and Federico Windhausen. Also included are some great interviews from SF Cinematheque’s archive with Owen Land, George Kuchar, Warren Sonbert and Peter Hutton. Cinematograph 7 may be purchased on SF Cinematheque’s website HERE. The following interview focuses on the conceptual ideas and exhibition history of Fitzgibbon’s structural film masterpiece Internal System. Film artists Sandra Gibson and Luis Recoder have written: “In one of her minimalist films, the viewer is presented with nothing but a blank microchromatic frame slowly shifting through various intensities of color saturation, flickering/shuttering repeatedly from light-to-dark (and back again) for a duration of 45 minutes. The only hint of information we have to navigate through this complex and difficult film is at the head and tail of the film, in the rolling text “credits” introduced as positive at the head of the film and negative at the end. Technical information such as film stock, film speed, film length, camera, lens, shutter, projector, and a host of other data appear on the screen like hieroglyphs of some secret language to be decoded. Whether we know what this cybernetic schemata means or not, Internal System abandons us to the pure phenomenological ecstasies of cinematic temporality – the reveries of a radical filmic monochromism. At the end of the sojourn the titles repeat but in negative, as if the experience of their effects – purely visceral rather than analytical – offer no direct correlation to the mechanism they wield.” (Catalogue for the Independent Film Show 7th Edition, Naples, Italy) This interview was conducted by Gibson and Recoder at Fitzgibbon’s studio in NYC, December 6, 2008. Sandra Gibson / Luis Recoder: What is it like to be showing your early films again? Your films have been at the New York Film Co-op since the mid-70’s and people have been renting them on a sporadic basis here and there. We pulled them out to get them preserved, and are currently screening them. What is it like to revisit this body of work? Are there new experiences that emerge, especially in interacting with newer audiences? Coleen Fitzgibbon: There are always things you wish you had done, but then that would have been another film. Showing the films again does bring up some of the same thoughts I had when they were first shown, such as how audiences receive them, and it isn’t always, you know, happy. Internal System is not like showing an audience a Hitchcock film with a plot, an ending and great images in between. When the film was screened for the first time at Knokke-Heist, 297 people walked out of 300 people in the audience. Gibson / Recoder: But that’s the very crux of this kind of filmmaking. In other words, when you were making these aesthetic choices it was somewhat of a critical act that deliberately applied pressure on audience expectation. You were obviously challenging your audience and didn’t care to appease them. Fitzgibbon: As you both know, experimental films can been aggressive in deconstructing audience expectation, and it’s usually filmmakers making films and videos for other filmmakers. That’s about as diverse as the audience gets.